Call me a kid, but I love Christmas. It's my favourite time of the year and still holds for me the magic that it did when I was a child. Toronto is a great place to celebrate the Christmas season. There's so much to see and do, whether it's the Santa Claus Parade, the tree lighting ceremony and fireworks display at Nathan Phillips Square, or watching the Nutcracker performed by the National Ballet of Canada. 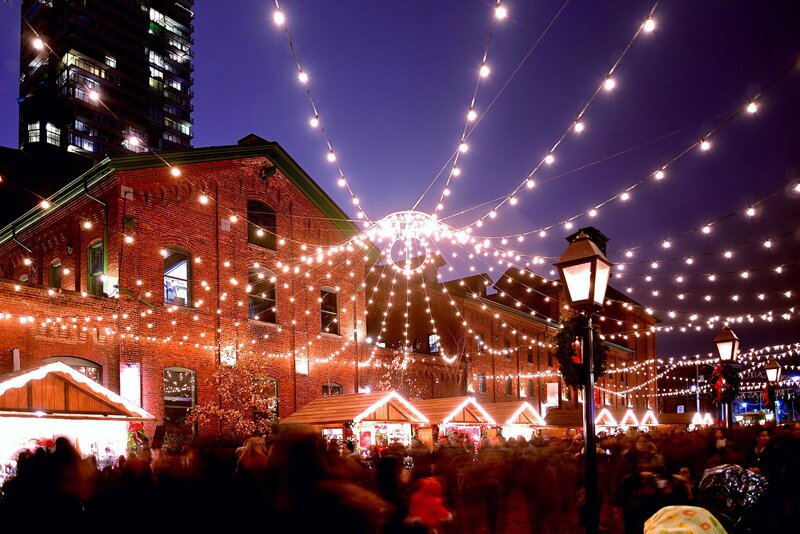 But my favourite Christmas event is definitely the Toronto Christmas Market at the Distillery District. 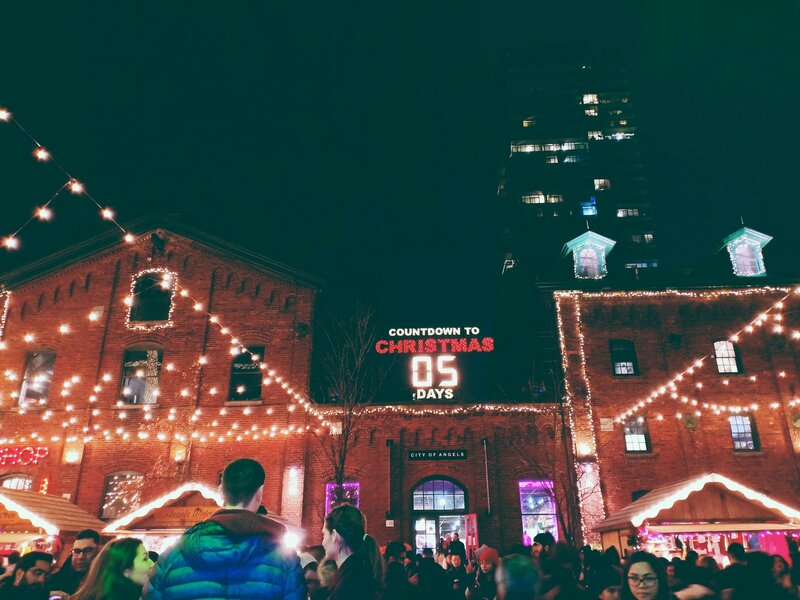 The Toronto Christmas Market is an annual holiday event held in December and runs for two weeks. It takes the cobblestone streets and rustic buildings of the distillery district and turns the whole location into a traditional European street market. There's food, drink, and entertainment for all (especially families) to enjoy. I've gone to the Christmas Market two years in a row since finding out about it, and it really does capture the magic of Christmas more than any other holiday event I've attended in the city. As you walk through the front gates, you're greeted by a huge sign made of white lights that says TORONTO CHRISTMAS MARKET. As soon as you set foot inside the Distillery, you're immediately transported back in time. The Distillery, with its old-timey feel, really is the perfect location for this event. You genuinely feel like you're in a European street market in the 1800s. Look above you and you see a spider-web of white lights suspended above the street. Lined along the street are wooden stalls, filled with all manner of delicious foods and also handicrafts. The smells wafting from the stalls are irresistible and you'll be hard-pressed not eat to your heart's content before the night is over. Just some of the delicacies on hand are grilled cheese sandwiches, poutine, rum balls, and even chocolate-dipped bacon! 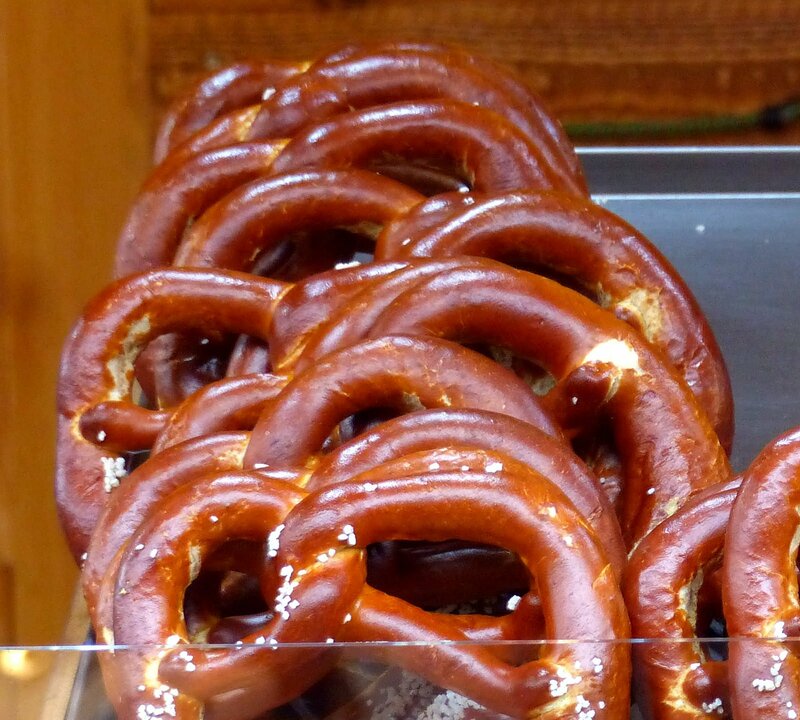 You're bound to put on some pounds at the market with delicious food like this. Walk a little further along to the main square and you're greeted by a huge 45 foot Christmas tree adorned with lights and decorations. Right beside it is a stage with carolers singing traditional Christmas tunes. Behind them is a carousel and ferris wheel for the kids to enjoy, but equally enjoyable for couples on a romantic date. Also for the kids is a hedge maze with a surprise at the end.....Santa! Kids can sit on his lap, tell him their wish list and get their picture taken. But there are attractions for the grown-ups too. The Christmas Market includes a beer garden where visitors can warm up with all manner of festive drinks. These include many varieties of beer, European Christmas cocktails, hot rum beverages, and the specialty of the beer garden, mulled wine. While you enjoy your drink you can sit down on any of the comfy chairs and couches that they've put outside for visitors. Don't worry about the cold either, if your drink isn't enough to warm you up, they've set up plenty of heat lamps and outdoor fireplaces to keep you toasty! Cozy up by the fire. Just be careful not to melt your shoes! All the shops and restaurants of the Distillery are open as well, so you can window shop or grab a meal if the food stalls aren't enough for you. Be sure to check out famous chocolatiers SOMA for a hot chocolate! There's plenty more to see and do at the Christmas Market. Check out their website to plan your visit. If you're in Toronto in December and are looking to celebrate the magic of Christmas, don't miss out on this event. It's great for a family outing, romantic date, or just a good time with friends.